Since 1999, Michael A. Rooke and Stewart L. Mader have been co-principal investigators of The Science of Spectroscopy. Funded by NASA through its National Space Grant College and Fellowship Program, the project has focused on rethinking how spectroscopy is taught in undergraduate chemistry courses. The work has resulted in a Web-based curriculum tool that is used at a number of colleges and universities both in the USA and abroad, including the UK, Taiwan, Germany, and Sweden. The Science of Spectroscopy is featured in several prominent digital libraries, including LearnNet from the Royal Society of Chemistry <www.chemsoc.org/learnnet> and the National Grid for Learning <www.ngfl.gov.uk>. In addition, the journal Science recently published a piece on the project in its Vol. 297 issue of 13 September 2002. The Science of Spectroscopy also recently became affiliated with www.science.gov, a U.S. government Web site dedicated to cataloging Web-based resources sponsored by government agencies. 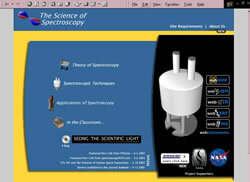 It is the only resource highlighting spectroscopy to be selected so far for inclusion on the site. Over the past year, the site's popularity with the Asian educational community has grown considerably. Approximately 25% of visits now come from Pacific Rim countries by way of The Infochem Project <http://infochem.nctu.edu.tw>, a digital library based at the National Chiao Tung University in Taiwan. The Science of Spectroscopy guides students through a study of spectroscopy, beginning with an introduction to light and its properties, the electromagnetic spectrum, types of light both visible and invisible to the human eye, and the effects of light interaction with matter. Students continue to a section presenting more advanced elements of spectroscopy theory, such as fluorescence, phosphorescence, and chemiluminescence. The site includes descriptions of common spectroscopic analysis techniques and applications of spectroscopy. The site also explains five of the most common techniques used to study light interaction with matter. Additionally, students can view three-dimensional molecules in a virtual reality environment, and they can manipulate and closely inspect spectra, the representations of data collected as a result of spectroscopic analysis of molecules. Another section of the site, provides an introduction to a wide range of spectroscopy applications: consumer devices, including microwaves and sunscreen; medical equipment such as magnetic resonance imaging, CT scanning, and cardiovascular imaging; and space science technology. A special subsection of the site focuses on NASA initiatives and missions in which spectroscopy is a key tool. One such example is the Hubble Space Telescope, which is highlighted for its ability to image distant nebulae, stars, and celestial formations through the use of infrared, ultraviolet, and visible light. The site's "Web Instruments" section gives students an opportunity to interact with virtual simulations of the instruments used to carry out spectroscopic analyses. Here students can become familiar with the general process of preparing a sample for analysis, collecting a set of data, and manipulating the data to find the desired information about the sample. The newest "Web Instrument" is a scanning electron microscope, which provides the user a range of samples and full capability to adjust brightness, contrast, focus, and magnification. The entire Web site is designed to tailor the learning experience to the pace, schedule, and interest of the learner. It also allows an instructor to use as much of the content as desired in a course, and content in one section can be used either in conjunction with, or independent of, any other section of the site. A major new addition to the Web-based material provided by The Science of Spectroscopy is the documentary Seeing the Scientific Light, which is scheduled for release this summer.